Educated at Lincoln College, Oxford, where he won a scholarship in history, Thomas began his writing career while still at college. He published his first book, The Woodland Life, a study of English natural history, in 1897. In 1899, he married Helen Noble. During the years following graduation, Thomas earned a reasonable living writing essays, biographies, reviews and doing some editorial work. In 1905, he began working as a literary critic for the London Daily Chronicle and became good friends with the poet W.H. Davies, who he encouraged. In 1914, while living in Gloucestershire, Thomas met Robert Frost, who was living nearby, and the two became close friends. Frost encouraged Thomas to write poetry and the two formed part of the Dymlock Poets, with Rupert Brooke, Wilfrid Gibson and John Drinkwater. 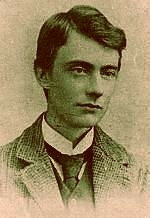 Thomas published a few poems under the pseudonym of Edward Eastaway during this period. From 1914 to 1917, he wrote 143 poems, the majority of which were published after his death. In 1915, Thomas enlisted in the Artist's Rifles and later became attached to an artillery unit. He was killed on Easter Sunday by an exploding shell at the battle of Arras. Thomas is one of the sixteen wartime poets commemorated at Westminster Abbey. His other works include The Heart of England (1906), The South Country (1909), Richard Jefferies (1909), The Icknield Way (1913), The Happy-go-Lucky Morgans (1913), Poems (1917 Posthumous) and Last Poems (1918 Posthumous).